Nervous system is the most complex system in human. Its uniqueness is due to the vast complexity of thought process and control action it can perform. It co-ordinates physiological functions in human. Nervous tissue originates from ectoderm and is specialized for receiving stimuli and transmitted message. The nervous tissue consists of highly specialized cells called the neurons. Thus neurons are functional unit of nervous system. The detailed structure of a neuron is shown in Figure. An Overview of Nervous System in animals. 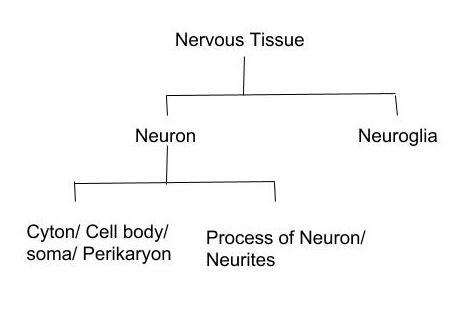 A neuron is mainly divided into two parts: 1) Cell body or cyton and 2) Cell process. It is a broader part of neuron which contains uninucleated cytoplasm. Except for centriole, all type of cell organelles is found in cytoplasm. Due to absence of centrioles, neurons can’t divide. Some other cells organelles like neurofibril and nissl’s granule found in neuron, which helps in transfer of impulse to cyton. Nissl’s granule is formed by coiling of endoplasmic reticulum around the ribosome. Dendron and axon are cell process of neuron. Fine branches of Dendron called dendrites, contains some receptor points so that Dendron receive the stimuli and produce centripetal conduction. Axon is the longest cell process of neuron. Axon is covered by axolemma. Part where axon arises from cyton called axon hillock. Cytoplasm of axon is called axoplasm which only contains neurofibrils and mitochondria. The terminal end of axon is branched and vesicular called telodendria. Some neurons are covered by layer of sphingomyelin (a phospholipid) called as myelin sheath or medulla. Myelin sheath is covered by thin cell membrane which is called eurilemma or Schwan cell. Myelin sheath acts as ian nsulator and prevents leakage of ions. Neurons are grouped structurally according to the number of processes extending from cyton. Unipolar neuron: Single process arises from cyton. e.g. nervous system of embryo. Sometimes this single process further divided into two processes. 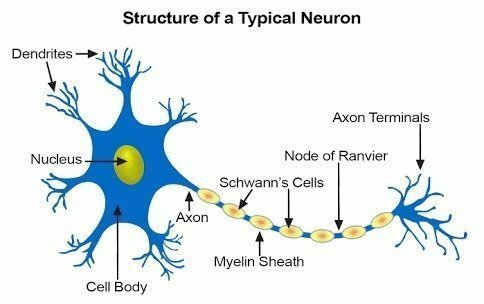 One of these acts as axon while others act as dendrite. These kinds of neurons are termed as pseudo-unipolar. e.g. Dorsal root ganglia of spinal cord and granule cells of olfactory bulbs. Bipolar neuron: Two distinct processes arise from cyton, an axon at one end and dendrite at another end. These type of neuron found in retina, olfactory epithelium, vestibular and cochlear ganglia. Multipolar neuron: These types of neuron have one axon but many dendrons. Motor neurons and interneuron are multipolar. Neurons of hydra and amacrine cell of retina have no definite cell process. These types of neurone are known as apolar neuron. Functionally neurons can be divided into three categories based on the direction of nerve conduction. Afferent or sensory neurons: Nerve conduction from receptors to the central nervous system. Efferent or motor neurons: Nerve conduction from the central nervous system to the effector organs. Initiation and conduction of nerve impulse. The cell membrane of nerve cell is said to be polarized when negative potential exists more inside the cell with respect to outside. The potential difference across the cell membrane at rest is called resting membrane potential and it is approx. -65 mV. 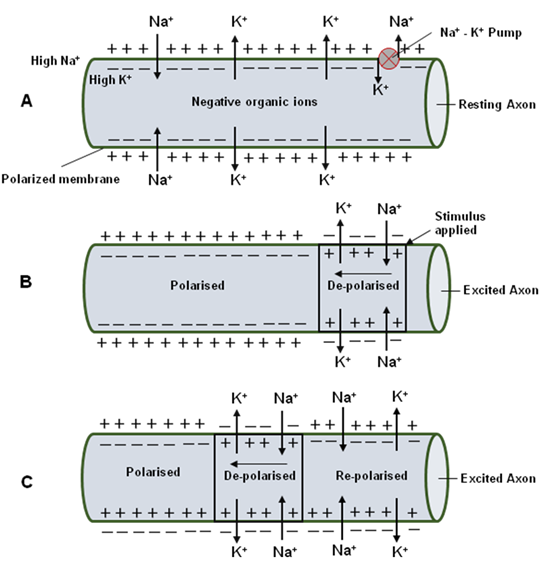 The resting membrane potential is maintained by active transport of ions against their electrochemical gradient by sodium-potassium pump and also by passive diffusion of ions. For active transport, there are carrier proteins located in the cell surface membrane. They are driven by energy supplied by ATP and coupled by removal of three sodium ions from the axon with the help of uptake of two potassium ions. The passive diffusion of ions opposes the active movement of ions. The rate of diffusion depends on the permeability of the axon membrane for the ions. Potassium ions have more permeability than that of sodium ions. Therefore loss of potassium ions is more than the gain of sodium ions. This leads to the net loss of potassium ions from the axon and generation of negative charge within the membrane. The event of depolarisation initiates a nerve impulse or spike. This nerve impulse is also known as Active potential, generated by change in sodium ion channel. These channels are known as voltage-gated channel. At resting stage, these channels remain closed due to binding of calcium ions. An action potential is generated by a sudden opening of the sodium gates. Opening of gate increases the permeability of membrane for sodium which then enters inside by diffusion. This increase in positive ions inside the axon drops the negative potential inside axon. A change of -10 mV in potential difference from resting membrane potential is known as spike potential, sufficient to trigger a rapid influx of sodium ions; which leads the generation of action potential. First, the negative resting potential is cancelled out, at this point the membrane is completely depolarised then the potential difference is developed across the membrane. The potential difference at 30 mV corresponds to the maximum concentration of sodium inside the axon. 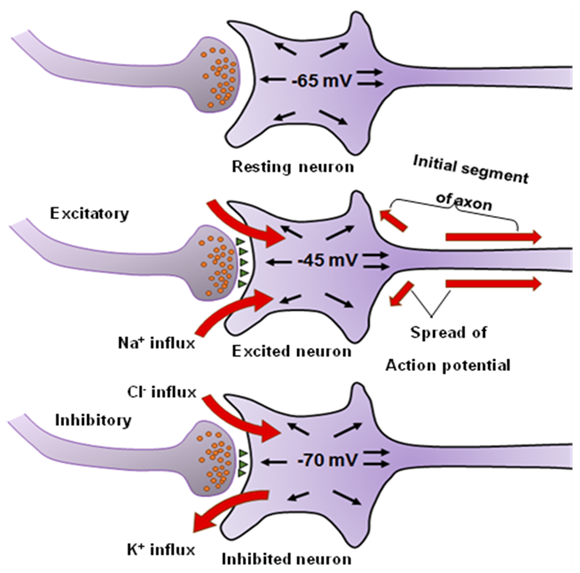 A fraction of second after the sodium gates open, depolarization of membrane causes opening of potassium gates, therefore, potassium diffused out of the axon. This causes less positive charge inside with respect to outside. Thus due to repolarisation, potential changes from 30 mV to -65 mV. The neuron is now prepared for receiving another stimulus and to conduct as described before. Now it’s necessary to restore normal resting potential by expelling sodium ions out and taking potassium ions inside. The time taken for restoration is called refractory period because during this period membrane can’t receive another impulse. All three state of neuron is shown in Figure. The area of functional contact between two neurons for transmission of information is known as synapse. In a synapse, membrane of telodendria is called as pre-synaptic membrane and membrane of dendron of other neuron is known as post-synaptic membrane and the space between these two membranes is known as synaptic cleft. When action potential develops in pre-synaptic membrane. It becomes permeable for calcium ions and Ca2+ enters in pre-synaptic membrane. When vesicles burst by the stimulation of Ca2+ it releases acetylcholine (Ach). Then Ach reaches the postsynaptic membrane via synaptic cleft and binds with receptors, which develop excitatory postsynaptic potential. 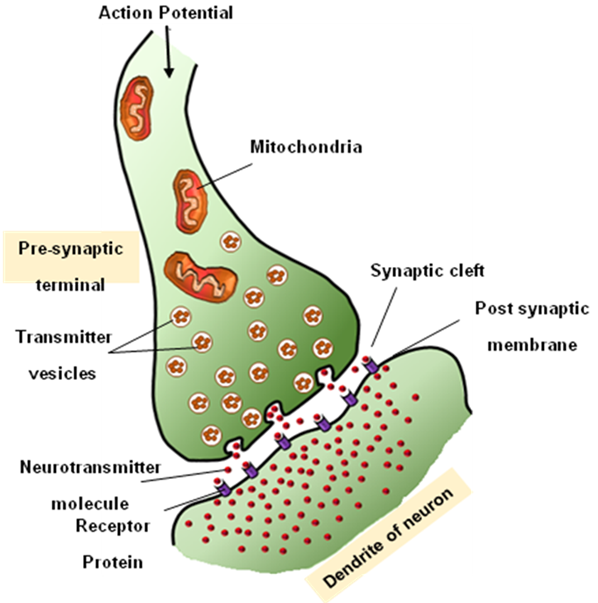 The process of synaptic transmission is shown in Figure.